The Bf 109G-5 introduced the DB 6O5D engine with MW-50 water-methanol power boosting (making possible a maximum power of 1,800 hp/1343 kW for combat bursts), while the Bf 109G-5/R2 featured a taller rudder and lengthened tailwheel leg in an effort to counter the aircraft's swing on take-off. 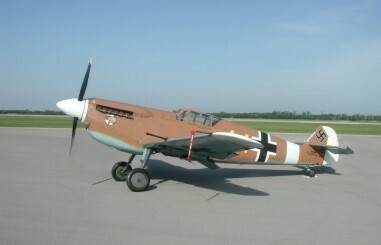 Ever since the introduction of the Bf 109F had removed wing-mounted guns from the 109, a controversy had raged over how a fighter should be armed. In the hands of an expert the Bf 109F's three guns were adequate against fighter targets, but the quality of Luftwaffe gunnery training had steadily declined (young pilots being expected to learn most of their skills on the job) and the Bf 109's most important targets had become heavily armoured Russian Shturmoviks and large American bombers, making three relatively slow-firing guns clearly inadequate. 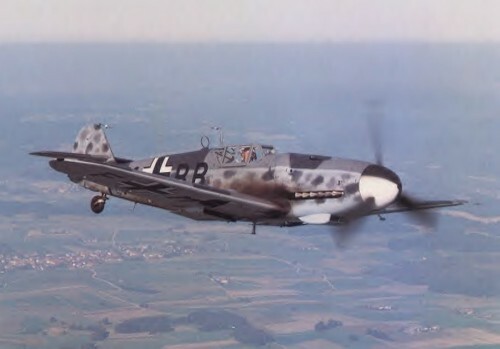 Therefore the Bf 109G-5 introduced a basic armament of a single hub-flring 30 mm MK 108 cannon, and two nose-mounted MG 131s, whose larger breech blocks were covered by the distinctive 'beulen'. Most important of all the 'Gustavs' was the Bf l09G-6 which, in various sub-variants, was powered by AM, AS, ASH, ASD or ASM versions of the DE 605 engine; with provision for two underwing 20 mm MG 151/20 guns. Numerous Rustsätze kits were produced to increase armament, including those to produce the Bf 109G-6/R1 fighter-bomber with a bomb load of up to 1,102 lbs (500 kg). Most aimed at improving the Bf 109's capability as a bomber-destroyer however, as the Defence of the Reich role steadily assumed greater importance. The Bf 109G-6/R2 bomber-destroyer had two 21 cm (8.27 in) WGr 210 'Dodel' rockets replacing the underwing cannon, while the Bf 109G-6/U4 (with an Umrust-Bausatz or factory conversion set) was armed with two 30 mm MK 108 underwing cannon, and the Bf 109G-6/U4N night-fighter carried radar. Tropicalised versions of most of these were also produced. The Gustav formed the backbone of the Luftwaffe's last mass operation, the ill-fated Operation Bodenplatte, a mass attack against allied airfields in France, Belgium and Holland aimed at destroying troublesome USAAF and RAF fighter bombers on the ground. Unfortunately, the Luftwaffe fighters suffered heavy losses while inflicting little damage, while destroying General der Jagdflieger Adolf Galland's preferred plan ('Big Blow') which was conceived as a mass operation (with 1500-2000 fighters) to destroy 500+ US bombers, whose crews would be irreplaceable. Galland believed that allied fighter bombers would be quickly replaced, and that while pilots in Bodenplatte would inevitably fall into Allied hands, many pilots shot down in 'Big Blow' would parachute safely into Gennan territory. Weight: Empty 5,893 lbs., Max Takeoff 6,945 lbs.